Gwen's South Side view is an urban suite. Pointed church steeples pierce the clouds. Poolroom chaps skip school and smoke. Four and five families live in one house. 63rd Street is a brown face muse. Gwen types her poems in a crowded corner. 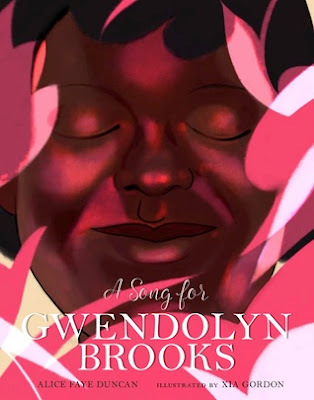 A Song for Gwendolyn Brooks by Alice Faye Duncan and Xia Gordon is a children's biography of African American poet Gwendolyn Brooks. Written in a poetic style, it tells about Brooks' childhood and her early writings, how her parents supported her unconditionally, and how she wrote so beautifully even at a very young age that she was accused of plagiarism by an elementary school teacher. To prove her daughter wasn't a plagiarist, Brooks' mother had her write a poem on the spot to show her natural ability. A smattering of her poems, from juvenilia to a poem written as an adult, are included. Alice Faye Duncan has created her own song to celebrate Gwendolyn's life and work, illuminating the hope and promise of the blank page, the tireless struggle of revision, and the sweet reward of success. That success included, among other things, a Pulitzer Prize. Highly recommended - A Song for Gwendolyn Brooks is a wonderful story about an inspiring woman. The two things that really jump out at you are the fact that she was determined (a natural talent, as well) and clearly her success was at least partly due to her parents' support. You really get a feel for the dedication required to be a successful poet. Because Gwendolyn was African American, A Song for Gwendolyn Brooks would make an excellent selection for Black History Month. The age range is 5 and up. Like a lot of Sterling Children's Books for the very young, there is a page that goes into further detail for a slightly older crowd, so it can grow with a child. A timeline of Brooks' life is included. There is a limited color scheme to the illustrations -- not my favorite, since I like a children's book to fairly shout at me in rainbow colors -- but it just seems to fit, somehow, so I didn't deduct even a fraction of a point at Goodreads for that. An unusual book, stylistically, that really works for the subject matter, as well. I received a copy of A Song for Gwendolyn Brooks from Sterling Children's Books for review. My copy will be passed on to a local teacher, since I think it will be a great addition to any elementary school library. ©2019 Nancy Horner. All rights reserved. If you are reading this post at a site other than Bookfoolery or its RSS feed, you are reading a stolen feed. Email bookfoolery@gmail.com for written permission to reproduce text or photos.